"I am darkness, soon I shall surround you"
In a far away solar system where humanoid felines once ruled, Dark Star was born. After a devastating war with an unknown alien race, that solar system fell into ruin. Dark Star was part of a scientific team that was nearly killed when their laboratory was destroyed. He put the remains of his team into cryo chambers and later himself knowing that they could not live long with their injuries. However, the technology to unfreeze his and his teammates' bodies from stasis was still under development. He had hopes that some alien intelligence would be able to free him and his companions and he might at some point return home. The urgency to defeat the aliens attacking Dark Star's far away solar system was too apparent. His subconscious mind was able to wake his entire mind from its dream state just in time to find out that his ship had drifted to Cybertron via the alien's artificial wormhole. Using robotic drones and Cybertronian technology, he built himself a new mobile body. No longer feeling the irrational urges to rush into battle he once felt out of stasis, he decided to recruit a strike force that could attack the aliens on all fronts. After abducting three perfect candidates and convincing them to help with his plans, he designed and built enhancements for their bodies using metals from his home planet. Inorder to insure the secrets of his ship remainded secrets, he initially deleted their surface memories and allowed the experiences aboard his ship to reside in their sub-conscience. 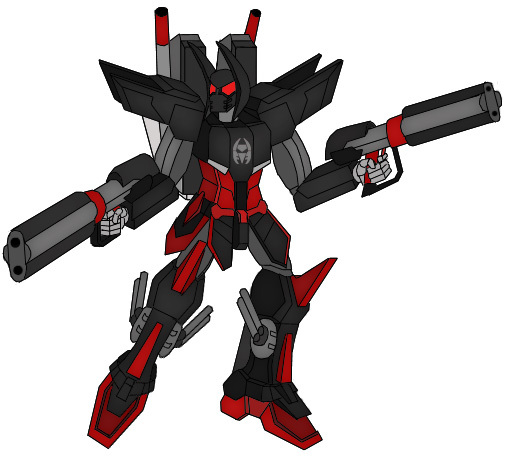 Since LONAC was not affiliated with either of the two main Cybertronian factions, he did not care that they joined. Due to his lack of biological functions due to his body being in cryogenic suspension, Dark Star is for the most part emotionless. Since he now acts on his former ways of thinking with no emotion to guide him, he is preceived as an opinionated jerk. Great sorrow or anger seem to be the only emotions that surface, and such occasions are rare. In robot mode, Dark Star carries two double barreled photon rifles that he can use to near pin point accuracy. He is often able to confuse enemies with a blinding barrage of direct hits that stop and disable them right in their tracks. He can also call forth a special power claw and shield which he can use to aid him in battle. Even without his weapons, Dark Star is a vicious fighter. He has his own form of fighting which at sometimes can resemble forms of Kung Fu. His unique fighting forms and use of chi more than make up for his lack in strength. Dark Star can appear to be invisible for short periods of time, an ability he uses to confuse his enemies. 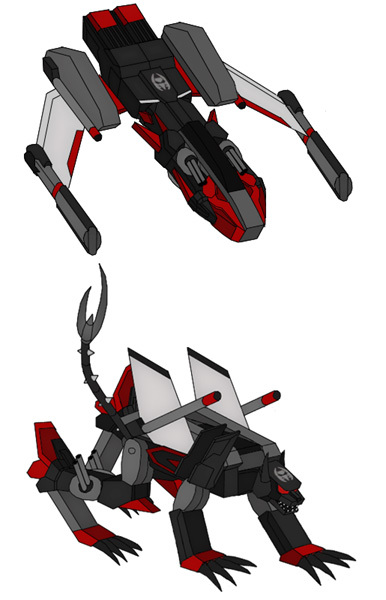 In jet mode, he flies at incredible speeds while taking out enemies directly in his path. He never has problems getting from point A to point B, but his strategy often leaves a lot of work for those who do not follow directly behind him. In panther mode, Dark Star can use all of his guns but he'd prefer to pounce on the enemy and rip them to shreds with his jaws. He is also able to optimize his natural instincts and abilities since his panther mode has virtually the same from as his organic body. Dark Star also transforms into Razer's torso. Dark Star joined LONAC because he no longer had a purpose for existing after he had extracted the revenge on the alien race that destroyed his solar system and with it everyone he ever cared about. He doesn't feel like he is really part of LONAC, more like an outsider who is just bunking temporarily on the LSS Freedom. He probably wouldn't even stay on the ship if his star cruiser wasn't badly damaged and his Cybertronian recruits weren't so involved in LONAC. The only responsibilities he feels are toward Dark Force.